Salespeople know how to juggle priorities and tasks. 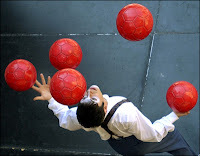 To maximize sales, you must keep multiple balls in the air. Once in a while, something gets dropped. When it happens, learn and move on. Don't waste time mourning lost opportunities. Instead, grab a new ball and get it in motion.